« Phone it like a Jarre! After great but technically difficult gig in Brno last week when I was forced to rip the tuner and the mixer off my board, disconnect the Moog synthesizer, having trouble to find the cold link in dozen of connections and spending some serious time on my knees, I decided to rebuilt my pedalboard after maybe two years. Also, I got a new unit as a Christmas present from Kristina, a Boss looper, so I wanted to fit another 173 mm in length onto my T-Rex Tone Trunk pedalboard. I put the power brick, T-Rex Fuel Tank Junior, up side down on the bottom side of the pedalboard, I bought multi-power-supply cable with angled connectors to feed more effects from one socket with minimum space wasted and I spent hours of re-gluing the velcro strips onto construction, bottoms of pedals and re-wiring the whole thing together. It’s done and it’s playing incorporating this chain of units: DOD VAC 240 input mixer, Boss TU-2 tuner, EHX Black Finger compressor, EHX LPB-1 booster, Ibanez Turbo Tube Screamer TS-9DX overdrive, MXR Phaser 100, EHX Small Clone chorus, Boss RC-20 loop station, Moog Moogerfooger Ring Modulator, Line 6 Echo Park delay and, last but not least, T-Rex Fuel Tank Junior. Oh, I forgot a Roland volume pedal controlling Moogerfooger’s frequency parameter and a Roland on/off switch controlling Moog Little Phatty keyboard gate. Further changes: I am going to change TU-2 for TC Electronic PolyTune (already ordered). I would like to add one more delay (Marshall Echohead EH-1) in front of the looper, Radial Tonebone Classic tube distortion and an EHX Little Big Muff. 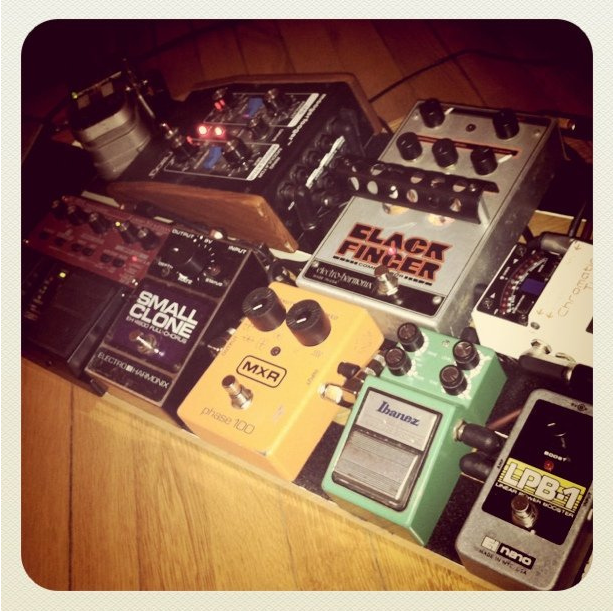 That said, I am going to change my board to bigger Pedaltrain HC Pro, probably.